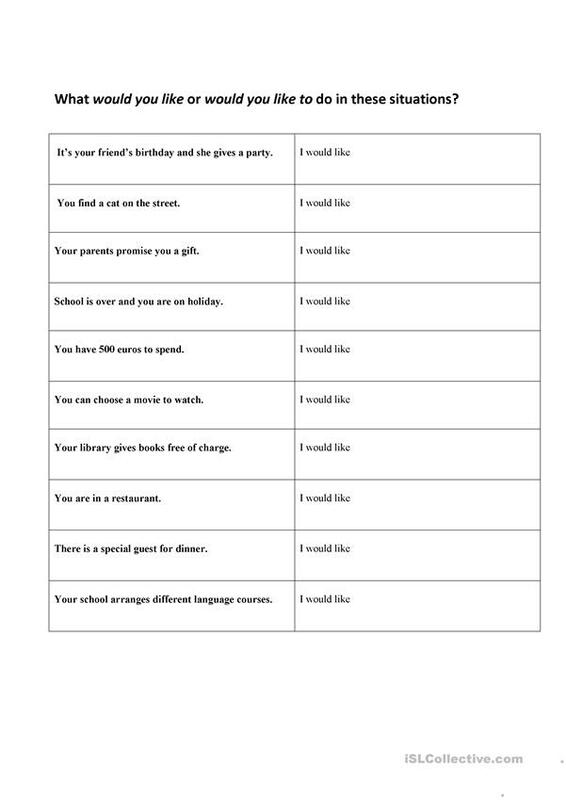 This worksheet is about Would like structure. It helps students to memorise Would like/would like to expressions. So that I propose an excercise in which they can practice this structure more times and use it with creativity to explain desires based on different situations. The present printable, downloadable handout is meant for high school students at Pre-intermediate (A2) level. It is valuable for consolidating Conditional 2 (second conditional) - would in English, and was designed for strengthening your class' Writing skills. It focuses on the vocabulary topic of Dreams. Pearlmeggie is from/lives in Italy and has been a member of iSLCollective since 2017-10-29 18:12:23. Pearlmeggie last logged in on 2019-04-18 16:00:02, and has shared 6 resources on iSLCollective so far.